Looking for some shade at the next competition? 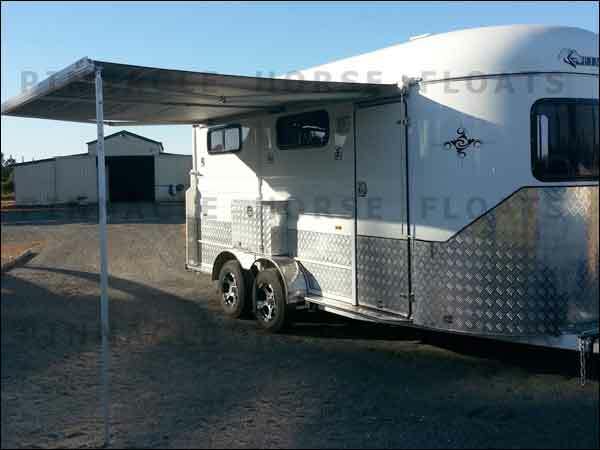 We offer a range of awnings to suit your horse float or gooseneck. Able to be installed on the LEFT and/or RIGHT sides of the trailer, these awnings are a great addition for any serious competitor or recreational user. Interested in horse float fit outs in Toowoomba? Check out our full range of options for interior horse float fit outs here. Caravan antennas are fiddly things. Many people have vastly different results with what appears to be exactly the same setup, and leads to much confusion. With more than 10 years experience fitting, diagnosing and repairing caravan/motorhome TV antenna systems, you can be assured we will get the best solution for your unique requirements. Slide out awnings are a great solution for any RV with a slide-out. They stop leaves and debris sitting on the top of the slide out and help to prevent rain and water running in through the slide out rubbers. We supply and fit slide out awnings matched to the exact size of your slide out. 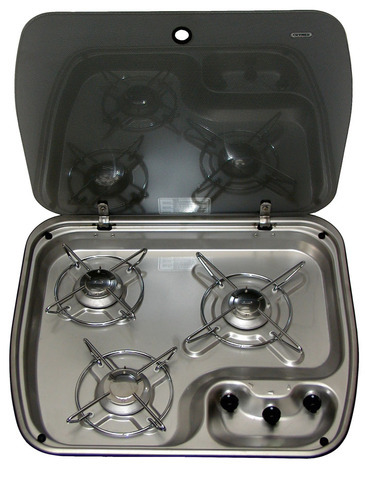 They are operated automatically with your slide out and don’t require any manual intervention. When it comes to servicing your caravan, not all services are the same. If you have a modern caravan, especially an off-road type, you probably have independent suspension. This comes in a number of varieties including coil suspension, independent rubber torsion, simplicity, control arm, and more. Servicing independent suspension is different to servicing standard load-sharing leaf spring suspension. There are a lot more control points and a lot more maintenance items to be addressed. It is important that you choose a service agent that is trained and certified in service and repairs to your specific type of independent caravan suspension. Additionally, sourcing parts many suspension systems can be difficult, especially if the caravan is more than a few years old. Unfortunately, some brands of caravans or chassis manufacturers choose to make their own designs, and with many makes/models no longer in production, it is necessary to fabricate replacement components in order to carry out a complete service and replace the wearing components. Our in house fabrication facility, and stock of suspension components allows us to ensure that your caravan’s independent suspension is fully serviced and ready for the next 10,000 kms. We stock a large range of parts and fittings for the Fiamma F45 wind-out awnings including the Fiamma F45S and Fiamma F45L. Popular on a wide range of RVs including European vans, motorhomes, campervans, and horse floats, the Fiamma wall mounted system is a fantastic compact design that doesn’t require vertical legs installed on the wall of the van. The support legs are housed inside the roll out tube, and fold down into place once the awning is wound out. Common issues with the Fiamma awnings are broken components, like legs, winches, split vinyl, lack of tension and impact damage. We are able to repair most Fiamma awnings. We offer installation of Fiamma awnings onto all types of vehicles. RV Service Centre Toowoomba is your local authorised applicator for U-POL Raptor linings. Popular for ute bed linings, underbody spray, caravan stone guards, off-road applications, flooring and more. Raptor linings applied by RV Service Centre are a suitable repair / upgrade option for Jayco owners wanting to renew or repair the stipple coating on the front of their caravans. We recommend our Raptor lining product for all owners for style side utes, as it protects the surface of the tray, and provides a non-slip surface for carrying goods. A much better alternative than drop in plastic ute tub liners because the Raptor coating is applied directly to the metal surface. The issue we commonly see with the plastic drop in liners is that water accumulates between the liner and the steel tray, causing rust and degradation to the body. Especially great for 5th wheeler owners, we offer Raptor linings as part of our hitch installation procedure. Your caravan door handle cops a hiding day-to-day! You open and shut the door multiple times, it gets slammed shut/open by the wind. It flexes and stresses as you drive down the road. Its a complicated bit of gear, having to operate the main door, screen door and the triple-lock system. By design they are fiddly and unfortunately fragile. We stock a range of door handles, and offer an on-the-spot fitting service. Door handles are identified by their brand and also whether they are LEFT hand or RIGHT hand. The “hand” is determined by the side of the door that the HINGE is located on, when looking from the exterior of the van. Ie, looking at your entry door from outside the van, if the hinge is on the left hand side, it is called a Left Hand Hinge Door (“LHH” Door), and you need to choose a Left Hand Door Handle (“LH Door Handle” or “LHH Door Handle”).